A world first for University Hospitals Leuven and KU Leuven, Belgium. Surgeons at University Hospitals Leuven have been the first to operate on a patient with retinal vein occlusion using a surgical robot. Operated by an eye surgeon, the robot uses a needle of barely 0.03 millimetre to inject a thrombolytic drug into the retinal vein of the patient. KU Leuven developed the robot and needle specifically for this procedure. The operation was successful and is a real world first: the procedure shows that it is technically possible to safely dissolve a blood clot from the retinal vein with robotic support. A phase 2 trial now has to show what the clinical impact is for patients with retinal vein occlusion, a disorder that can lead to blindness. In case of retinal vein occlusion (RVO) there is a blood clot in one of the retinal veins. This leads to reduced eyesight or even blindness in the eye affected. At the moment, treatment consists of monthly injections in the eye that only reduce the side effects of the thrombosis. Until recently, taking away the blood clot itself was not possible. Researchers from University Hospitals Leuven and KU Leuven are studying retinal vein cannulation (RVC), a revolutionary treatment that addresses the cause of retinal vein occlusion by removing the blood clot in the retinal vein. RVC is a promising method requiring the eye surgeon to insert an ultrathin needle into the vein and to inject a medicine that can dissolve the blood clot. A real feat, because a retinal vein only has the width of a tenth of a millimetre, about the same width as a human hair. No surgeon is able to manually inject a drug into such a thin vein while holding the needle perfectly still for 10 minutes. The danger of damaging the vein or the retina would be simply too high. 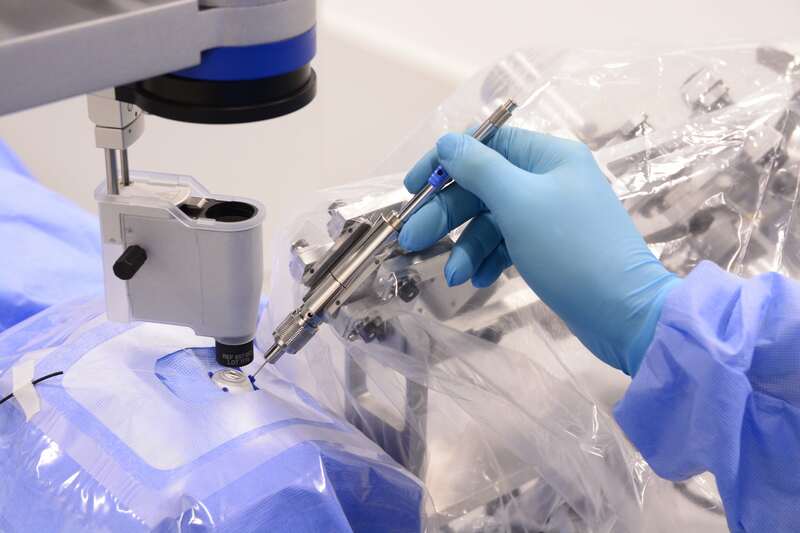 This is why researchers from the department of mechanical engineering of KU Leuven developed a robotic device enabling the surgeon to insert the needle into the veins in a very precise and stable way, after which the robot can hold the needle perfectly immobile. In contrast to most surgical robots, there is no need for a joystick to operate the device. The eye surgeon and the robot co-manipulate the instrument. The surgeon guides the needle into the vein while the robot eliminates any vibration of the needle, hereby increasing the level of precision more than tenfold. After locking the robot, the needle and the eye are automatically stabilised. The surgeon can then inject the product into the vein in a controlled way. The researchers also found a way of producing an ultrathin injection needle: the needle point has a width of barely 0.03 millimetre, three times thinner than a human hair. The robot is the result of seven years of research and a cooperation between KU Leuven engineers and University Hospitals Leuven ophthalmologists. 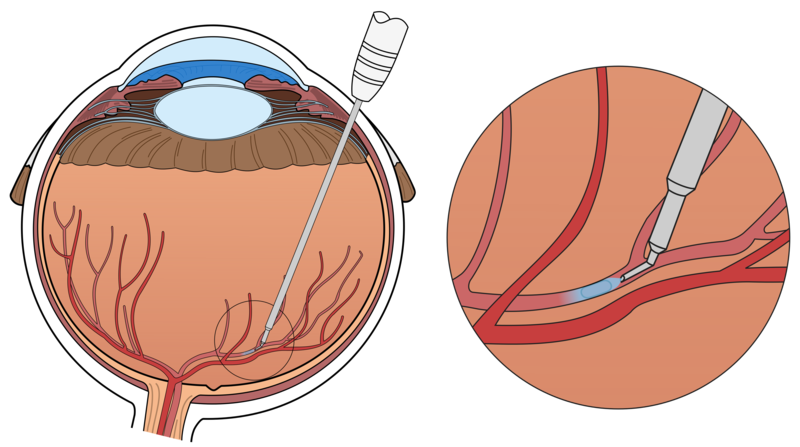 The current phase 1 trial aims to demonstrate that it is technically feasible to use a robotic device to insert a microneedle into the retinal vein and to inject the product Ocriplasmin to dissolve the blood clot. On the 12th of January 2017 the procedure was performed for the first time in a University Hospitals Leuven patient. The patient is doing well and can now start working on the rehabilitation of the eye. In a subsequent phase 2 trial the physicians will study the clinical effects of the procedure. Worldwide there are 16.4 million people with a blocked retinal vein caused by thrombosis in the blood vessel. In Belgium, there are about 25 000 patients.